Happy Friday friends! I hope you all have had a fabulous week and have a fun-filled weekend ahead! It’s time again for another Recipe Swap! 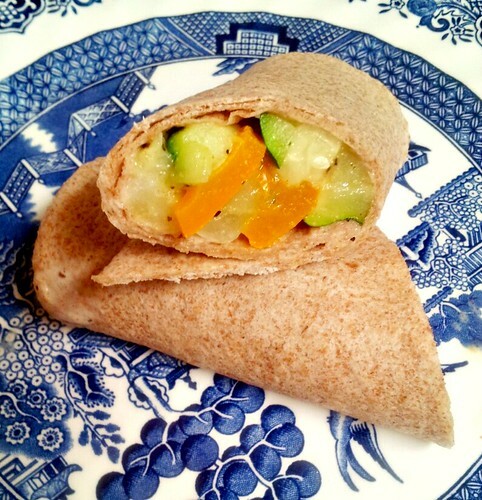 The theme for this round was Lunch, and I received this great wrap recipe from Jenni of Dough See Dough. I’m always looking for new vegetarian recipes to try, so I was excited about this one! I had to change a couple of the ingredients because mushrooms are a no-no in our house. Ha! But, J had never had eggplant before and I thought this might be a good way for him to try it out. I wound up making this for lunch on a rather busy day and J was running out the door about the time that it was ready so he only got to have a little taste of a piece of roasted eggplant (the texture was…different, he said), but I was able to gobble down a wrap(and take a quick pic) before running out to do errands myself. I think that the goat cheese spread is really the star of this wrap. The roasted veggies are delicious, don’t get me wrong, but I found myself spooning a little extra spread on each bite. It’s a little tangy, and a lot delicious! This is a great lunch meal that you can prep and throw the veggies in the oven while you get other stuff done around the house and then pretty much just throw together and chow down! Thanks Jenni for a great new lunch recipe! Be sure to check out all the other great recipes from the swap, below. And as always a big thanks to Sarah from A Taste of Home Cooking for organizing these! Preheat oven to 400°F. Line a large baking sheet with foil and set aside. In a large bowl, toss the vegetables with your seasoning, salt, pepper, and olive oil until evenly coated. Spread into an even layer on a large baking sheet. Roast for 20 minutes or until just tender. Set aside to cool. Meanwhile, make the goat cheese yogurt spread. Combine the goat cheese, yogurt, paprika, garlic, salt and pepper in a food processor. Blend until smooth. To make the wraps, spoon about 2 tablespoons of the spread onto each tortilla. Top with about 1/2 cup of baby spinach and 1/4 of the roasted vegetable mixture and roll it up tightly. Slice in half and serve. The goat cheese spread sounds fantastic! Yum! Mmmm…goat cheese spread. Love it!